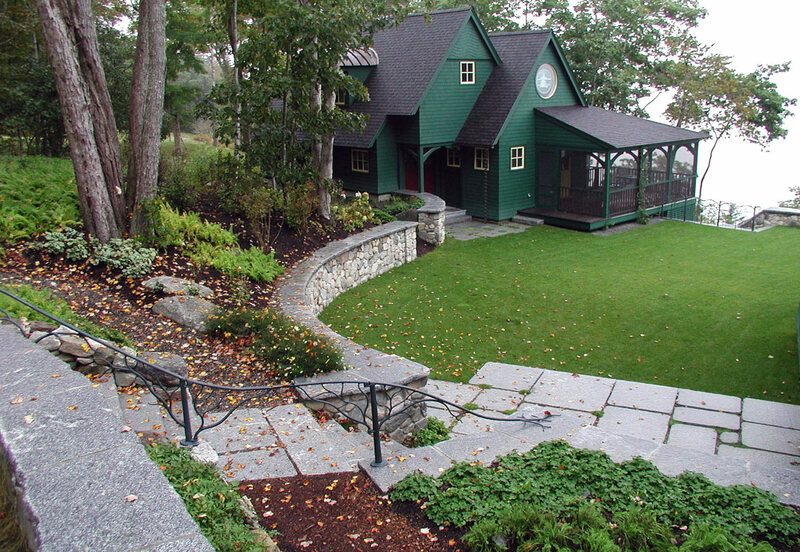 A new residence and guest house added to an existing family compound with a landscape respecting the woods and meadows the owners cherish. 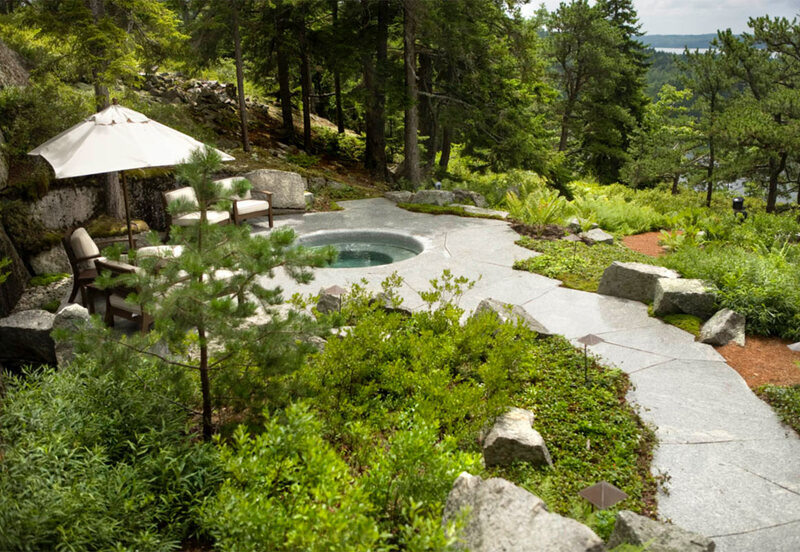 The landscape mitigates the steep slope of the site, creates privacy, and gives them the spaces they wanted for relaxation, recreation, and the companionable sharing of food, drink and conversation. 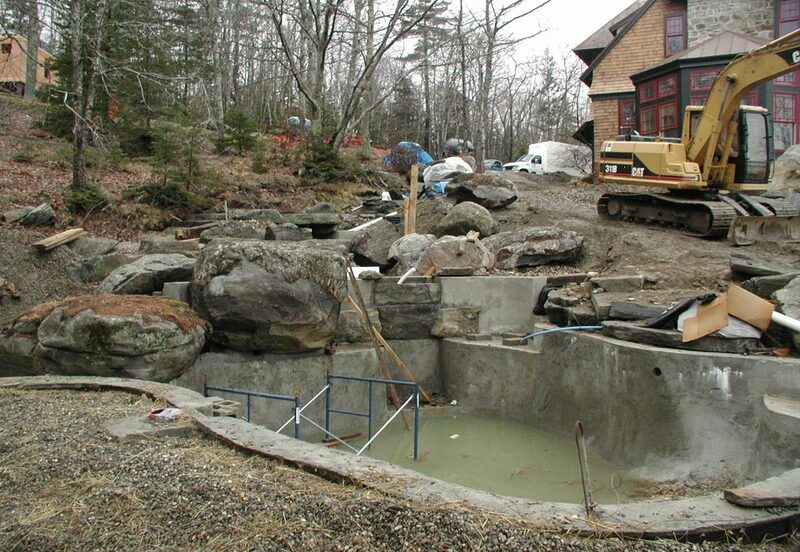 Occasionally, owners change their wishes. 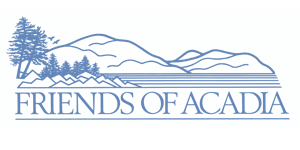 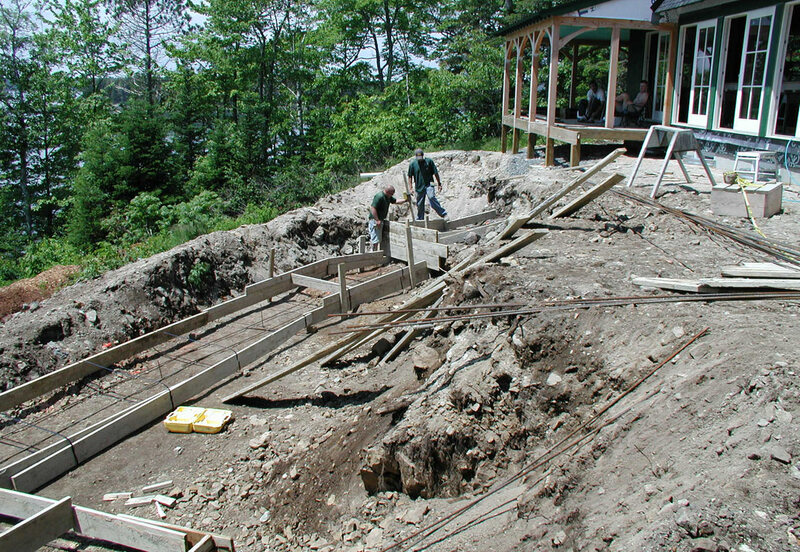 Designs must be altered after construction begins. 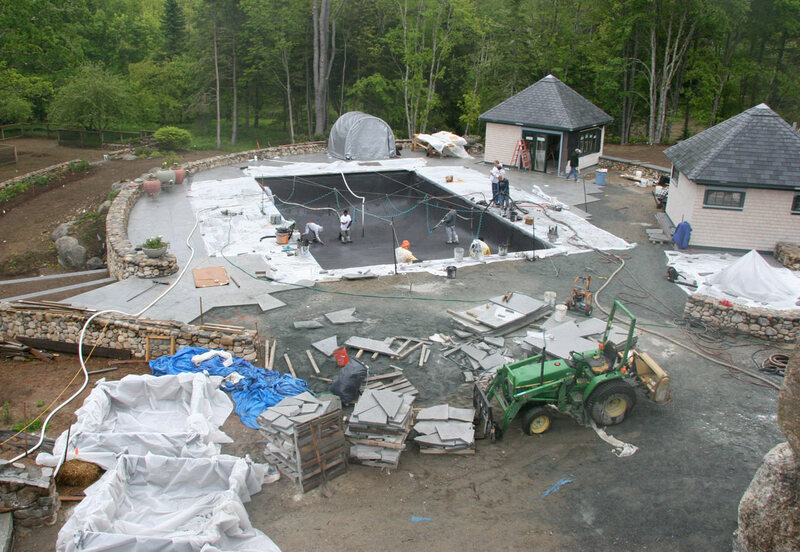 Such was the case with Good Hope Pool. 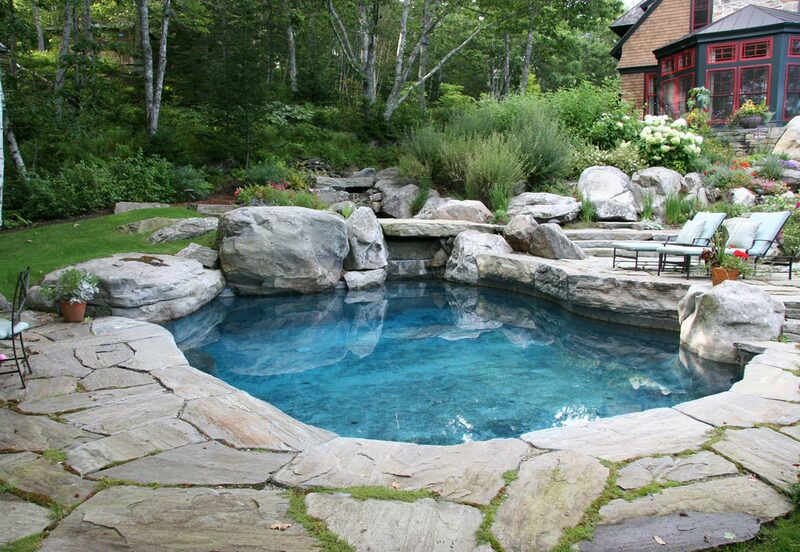 The original plans created design around an existing kidney-shaped pool. 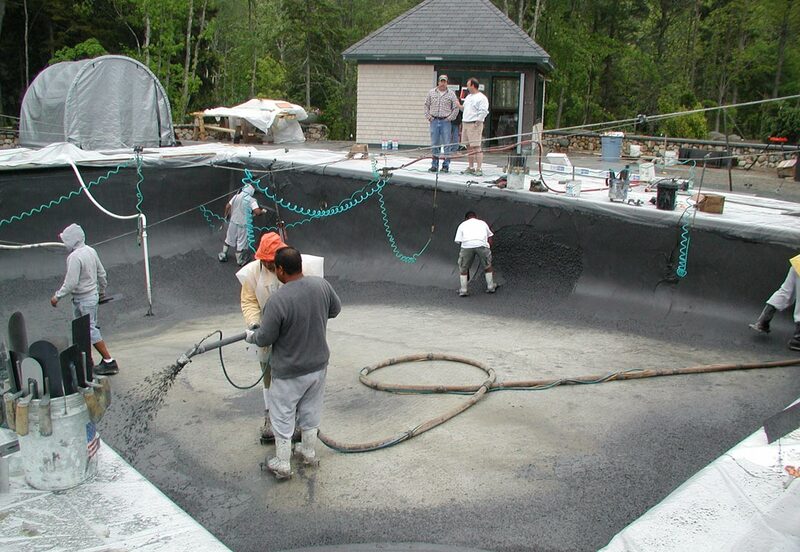 After installation began, the owner decided to rebuild the pool. 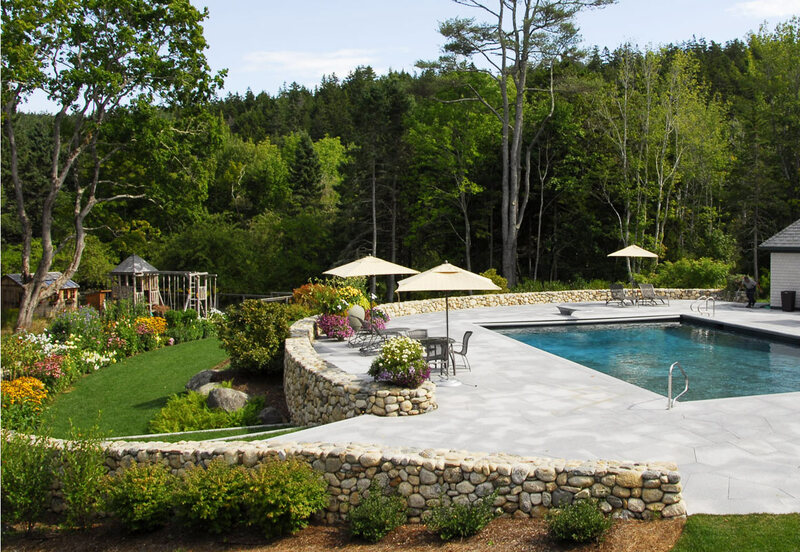 We provided concept sketches for cabanas appropriate to the pool and existing architectures along with extensive stone work including custom drain covers around the pool and cabanas. 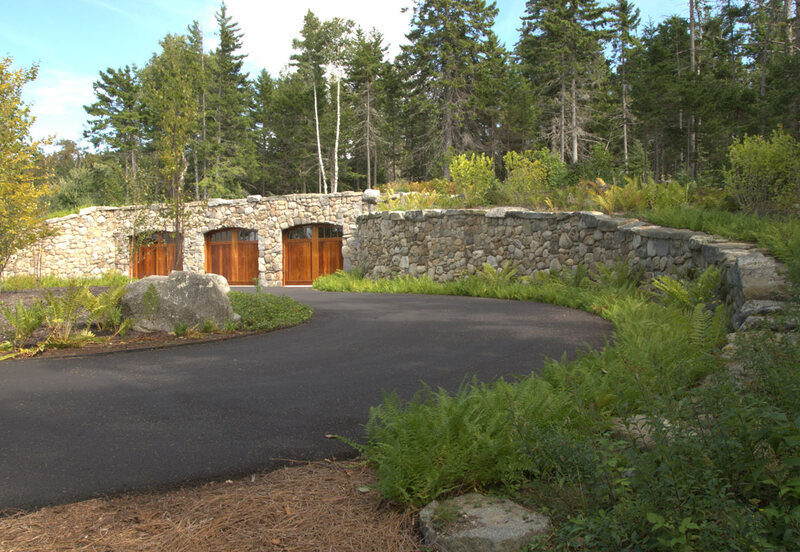 On this historic property, the owner wished for a hidden three car garage. 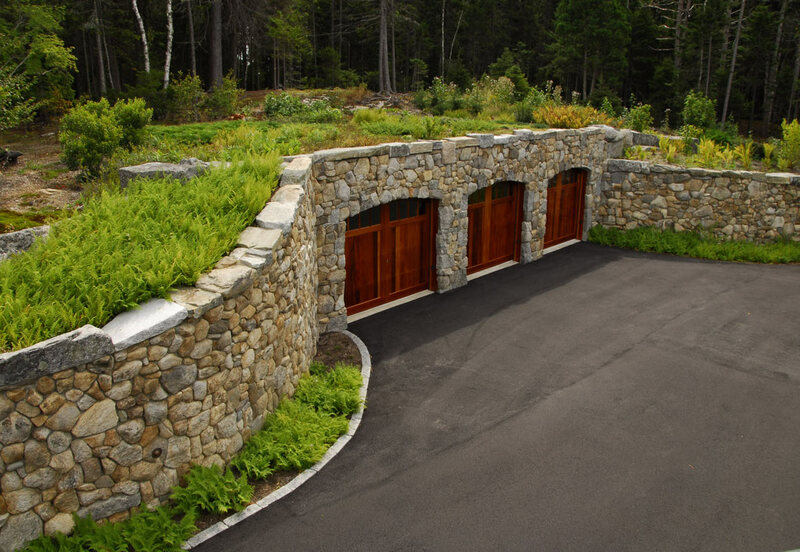 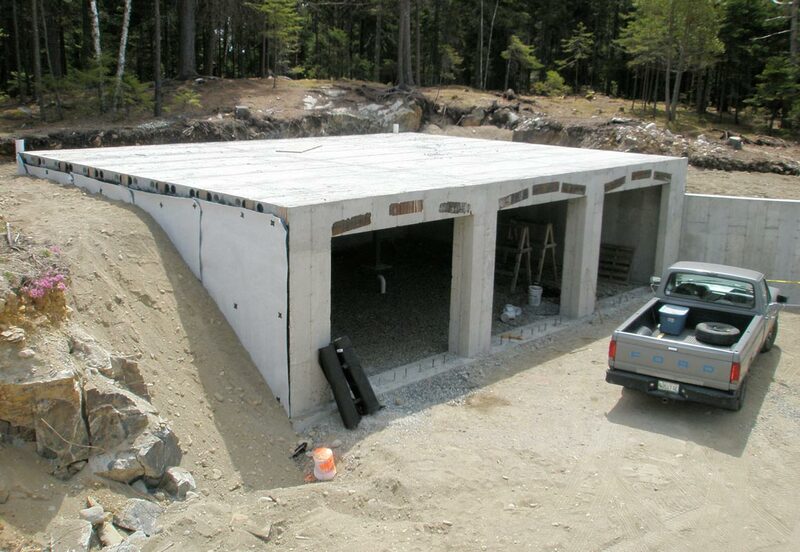 We suggested a car cave, built into the hillside with a green roof on top. 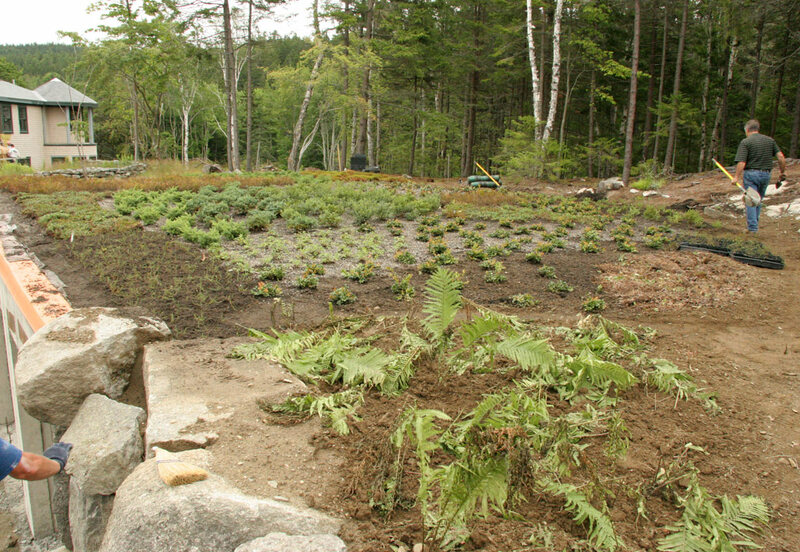 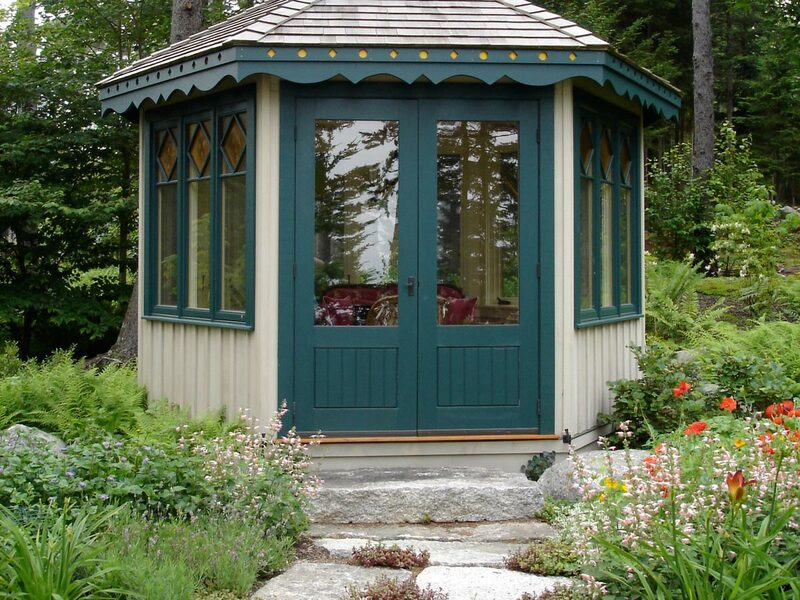 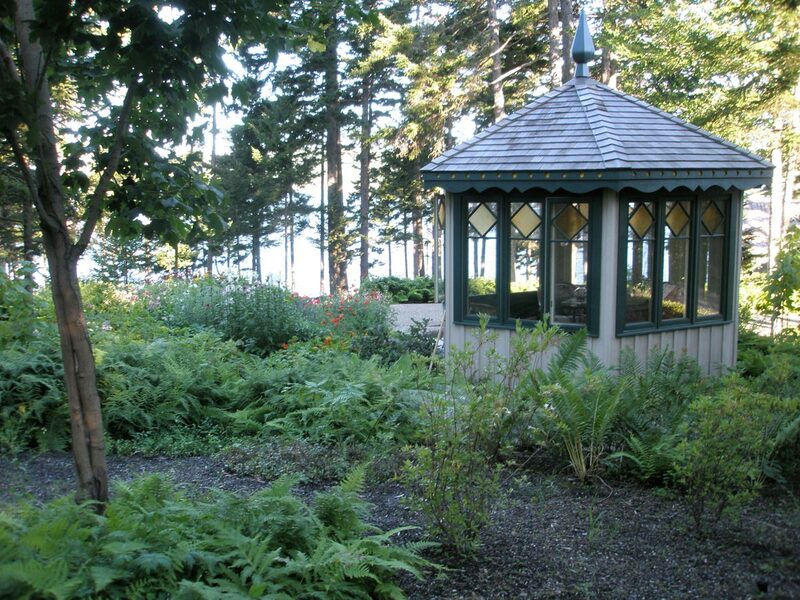 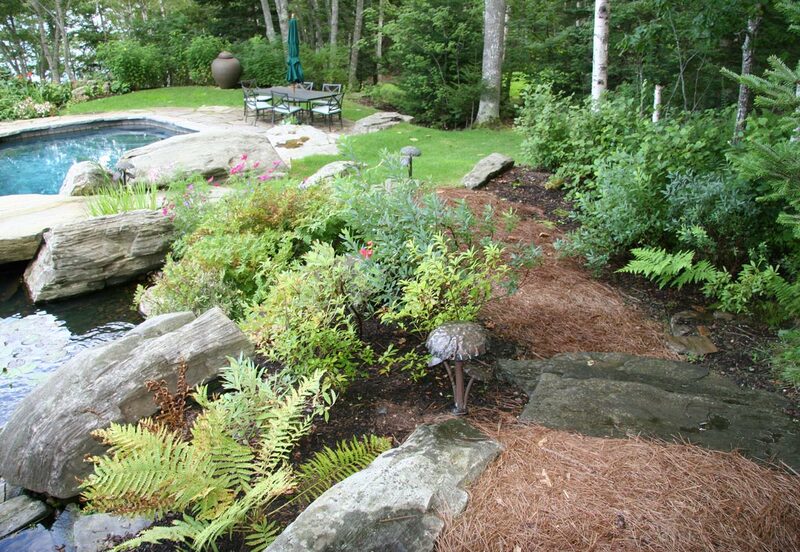 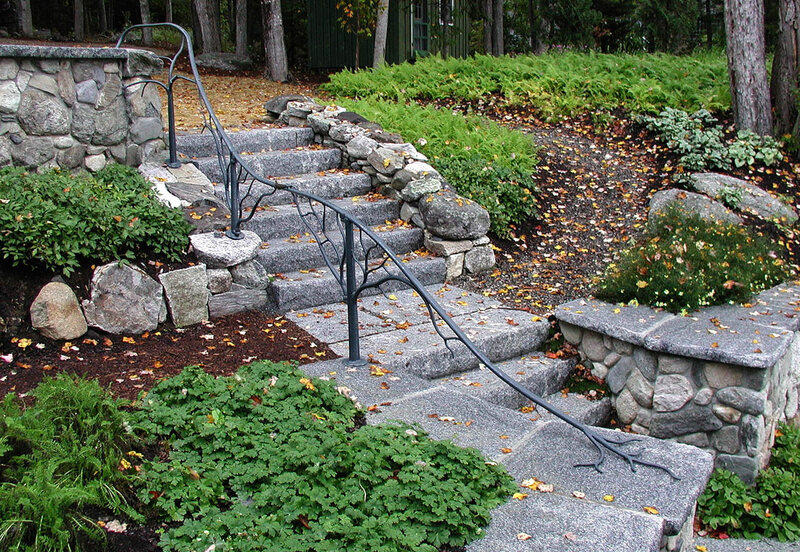 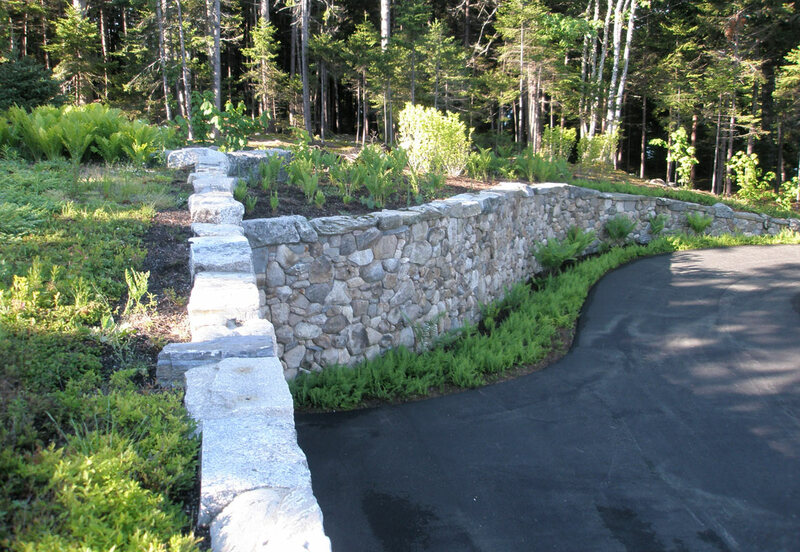 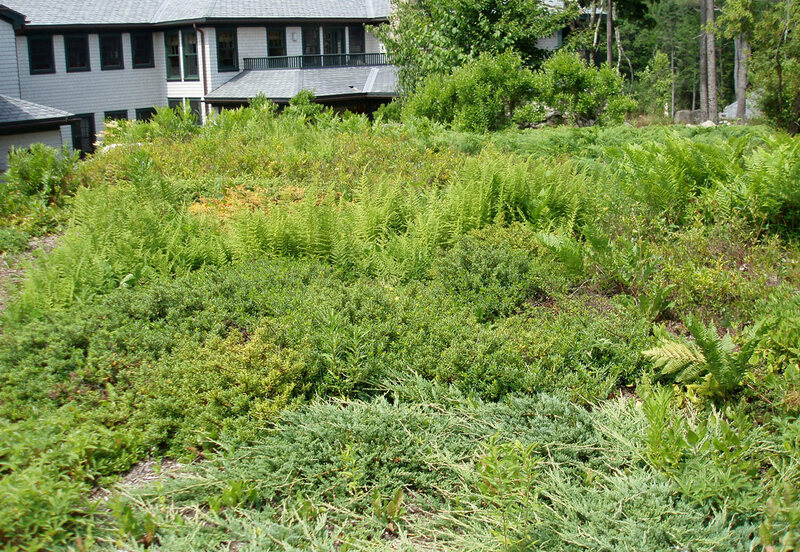 It was covered with native Maine plants – blueberry, bunchberry, sweet fern, mountain cranberry hay-scented ferns blending natural with new and creating a highlight of the property. 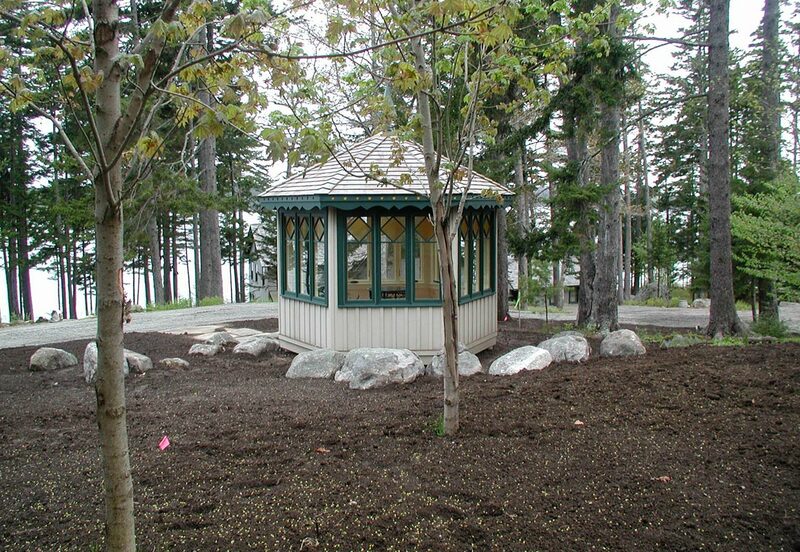 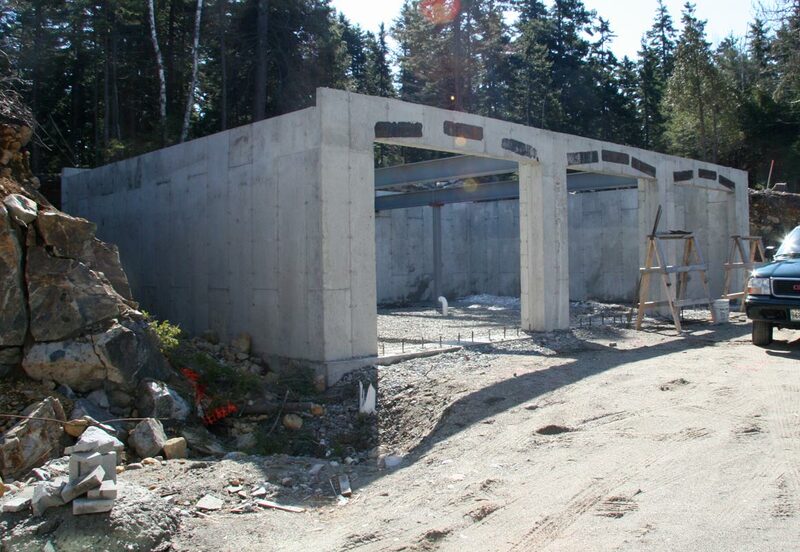 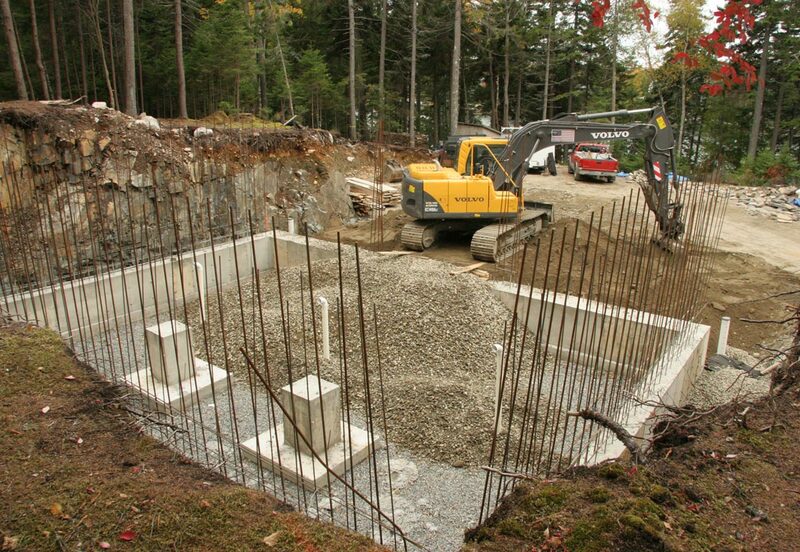 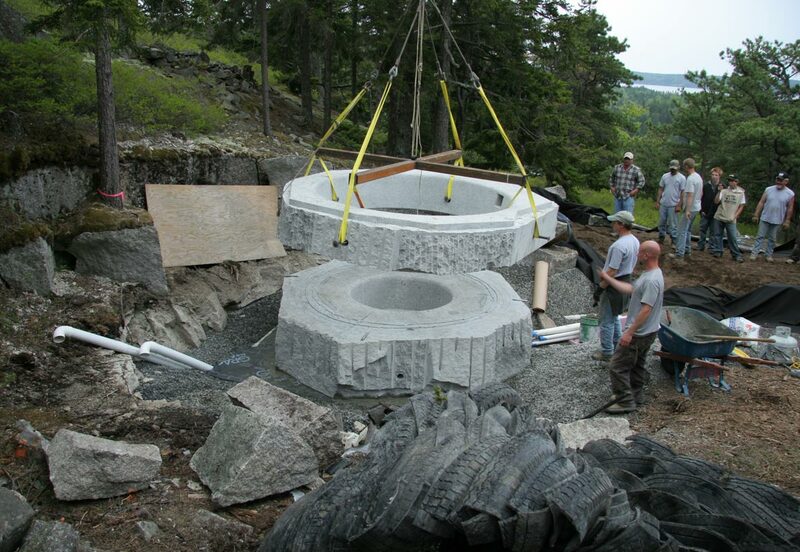 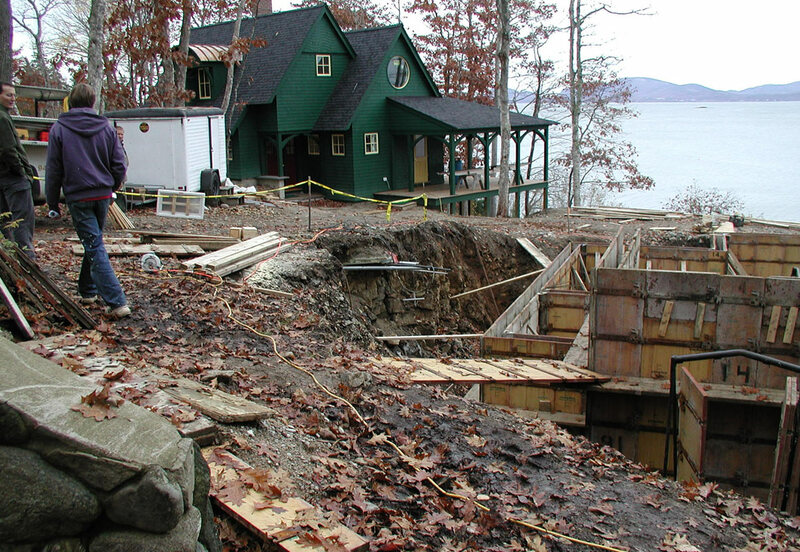 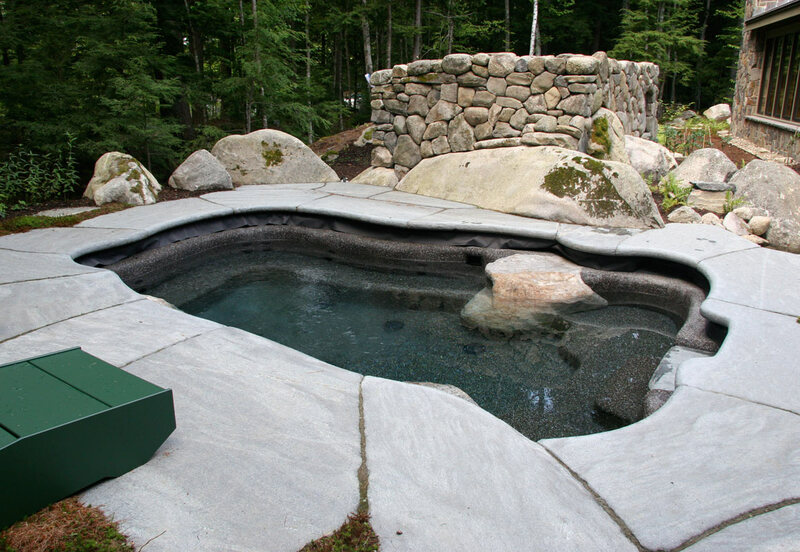 Built in a wooded area looking over a cliff, this custom spa was constructed from two pieces of granite weighing 40,000 pounds, requiring a 90-ton crane for installation. 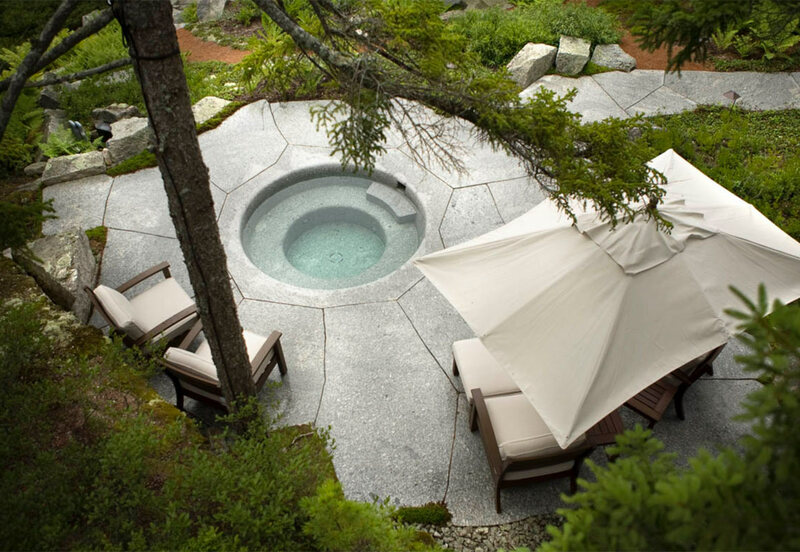 The mechanisms to control the spa are hidden behind a nearby boulder allowing easy access without affecting the aesthetics. 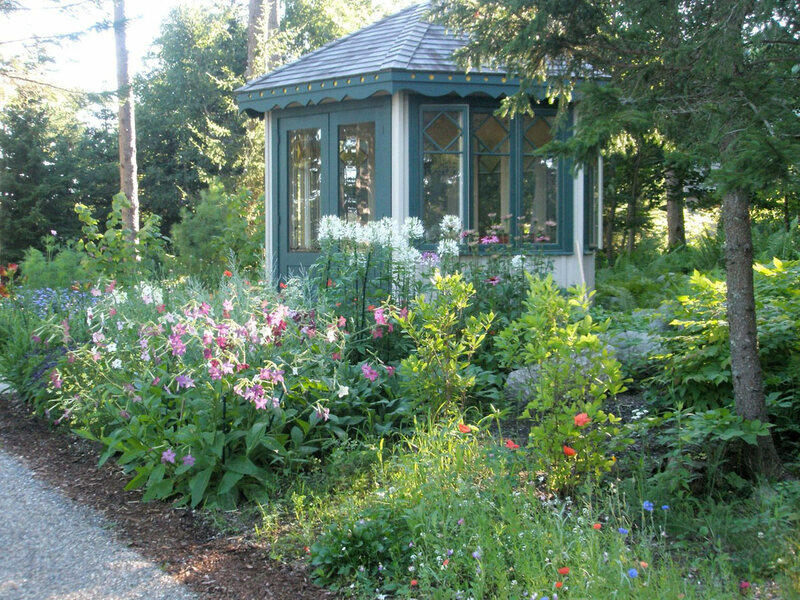 To represent her native heritage, the Austrian owner of this property wished for a lusthaus, a pleasure house, or a tea house surrounded by gardens. 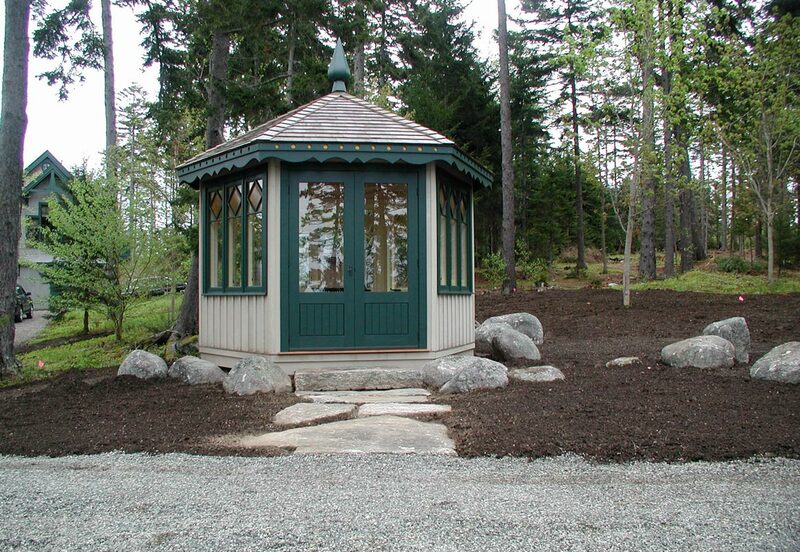 We nested her lusthaus into an existing native woodland with a view of the ocean and surrounded it with a meadow of wildflowers. 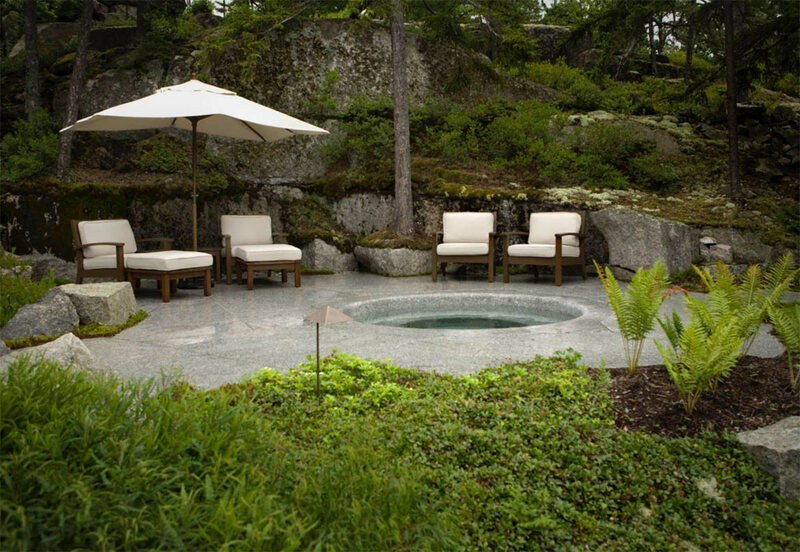 This custom-built spa in Midcoast Maine seats fourteen, with seats of varying heights to accommodate family members of all sizes. 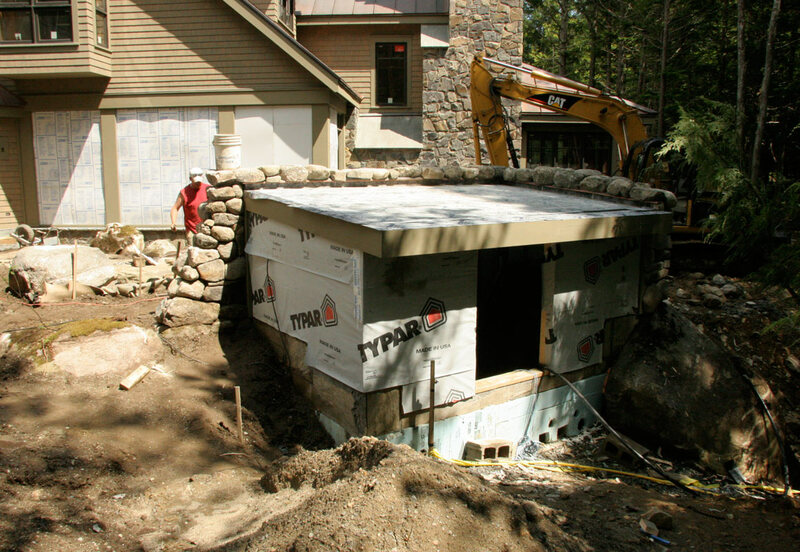 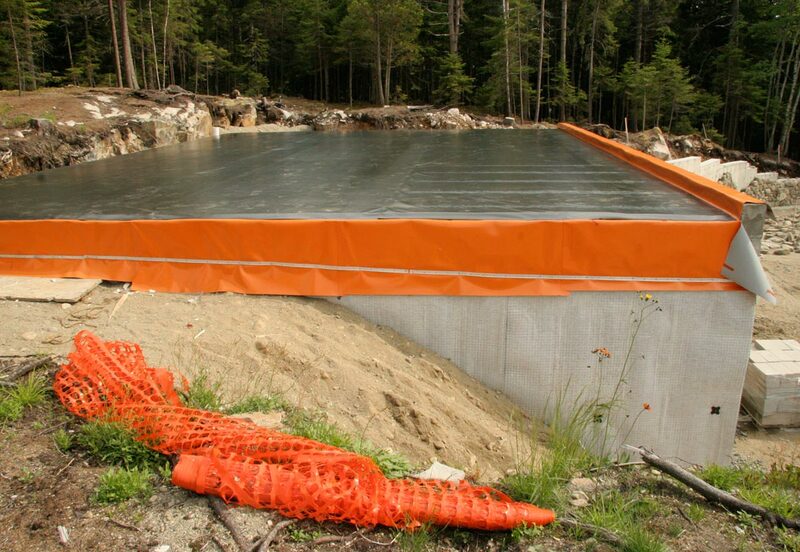 A mechanical house giving the appearance of a tumble down stone wall hides the extensive mechanicals required to operate the jets, lighting and hidden retractable cover. 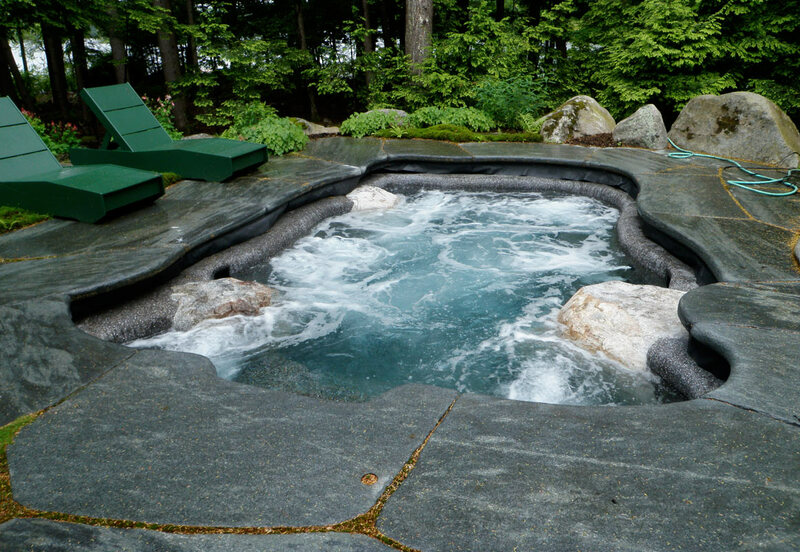 Inspired by large naturally occurring boulders in the surrounding landscape, this pool features a series of cascading waterfalls that appear to emerge out of the existing hillside. 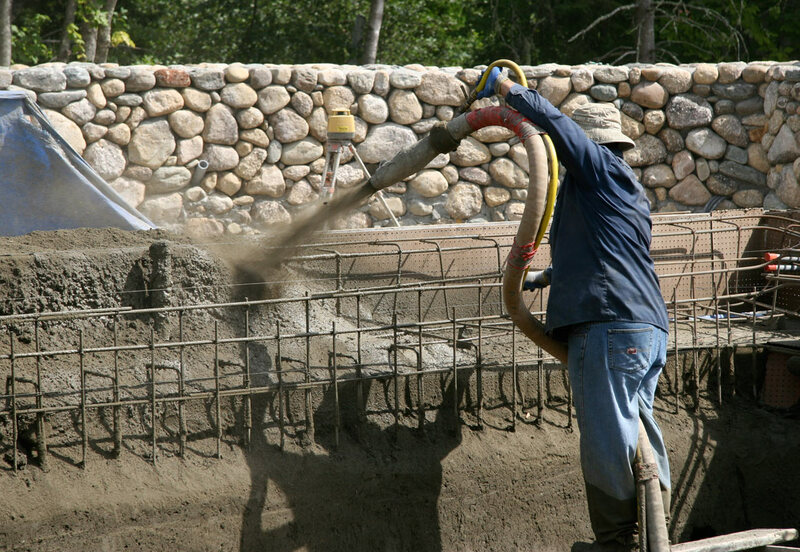 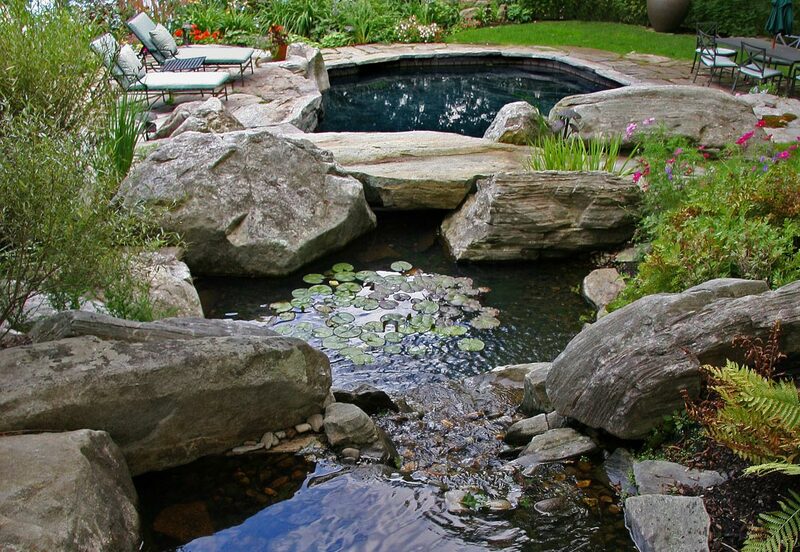 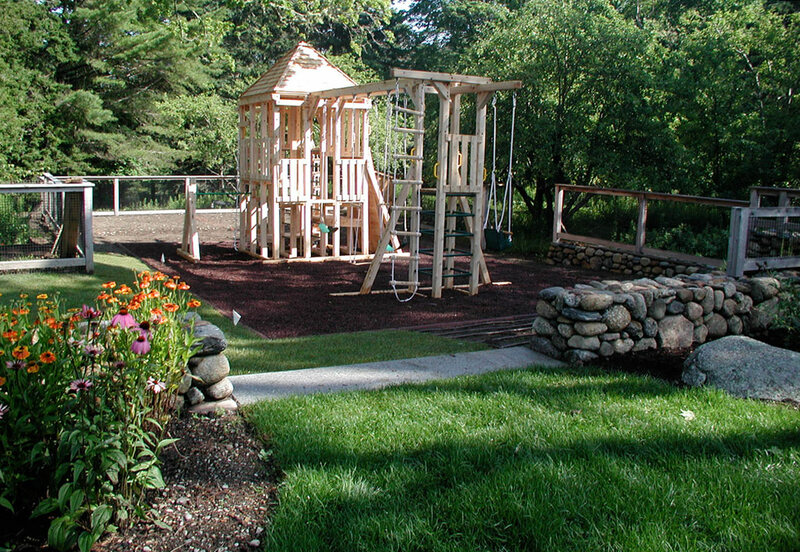 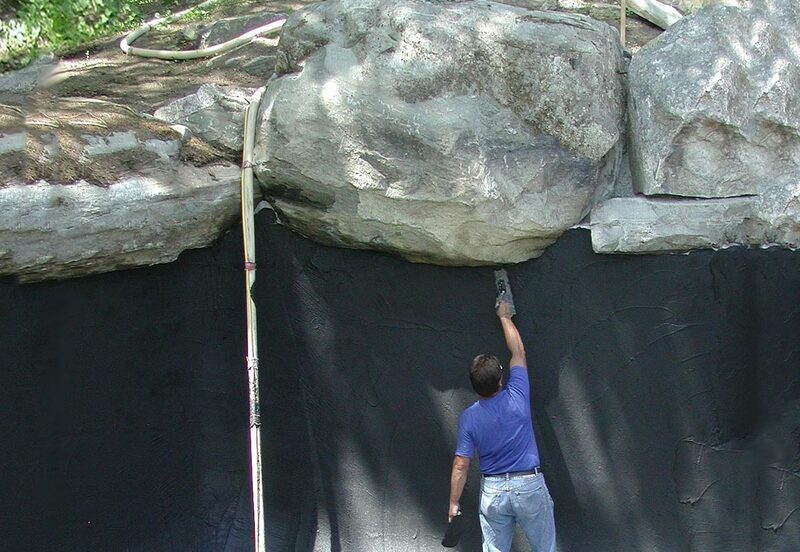 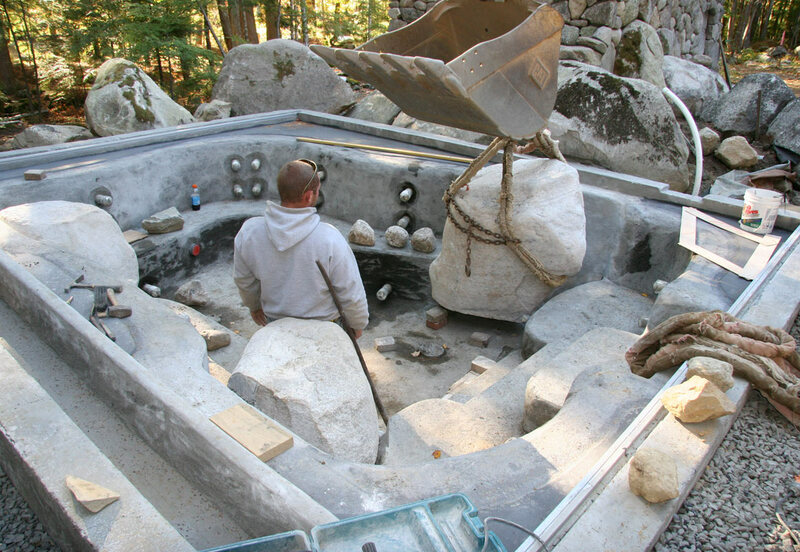 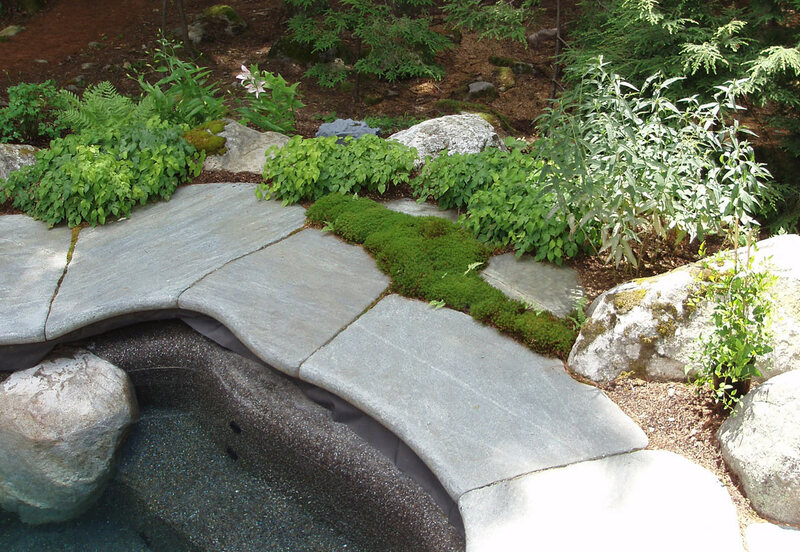 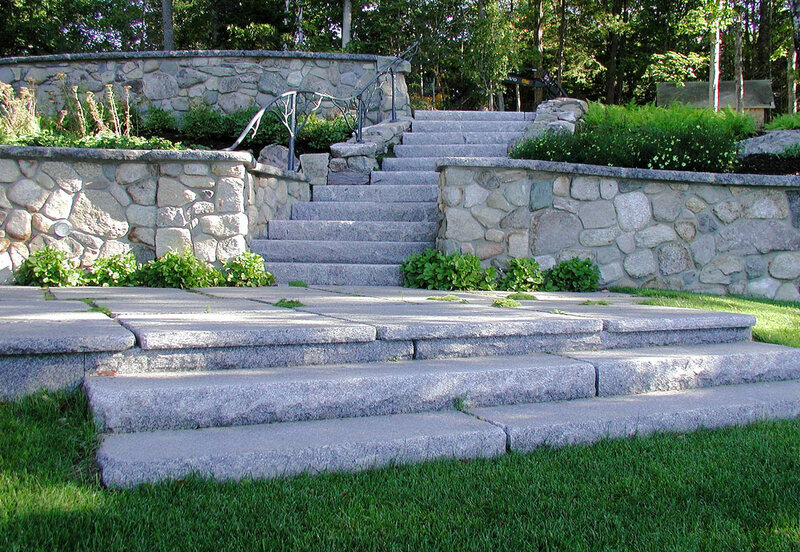 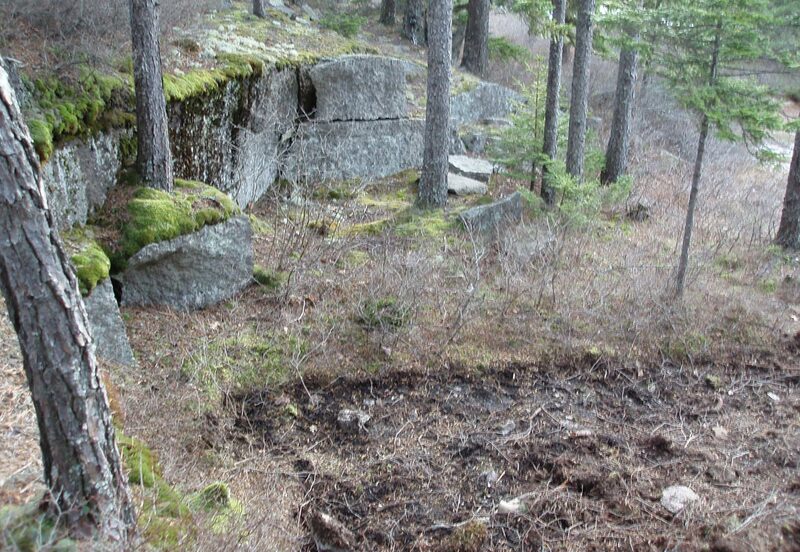 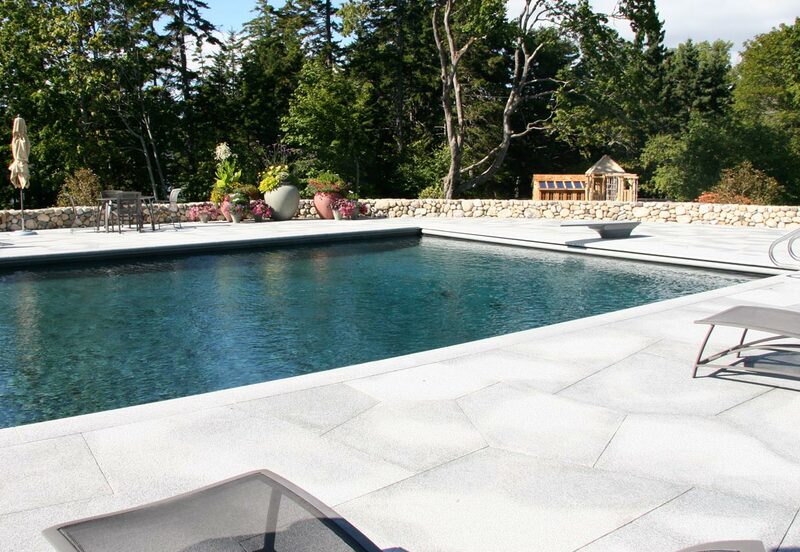 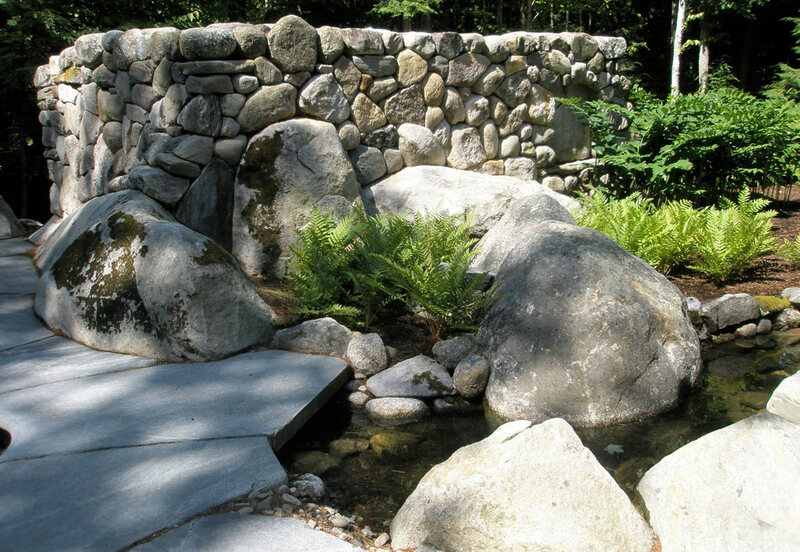 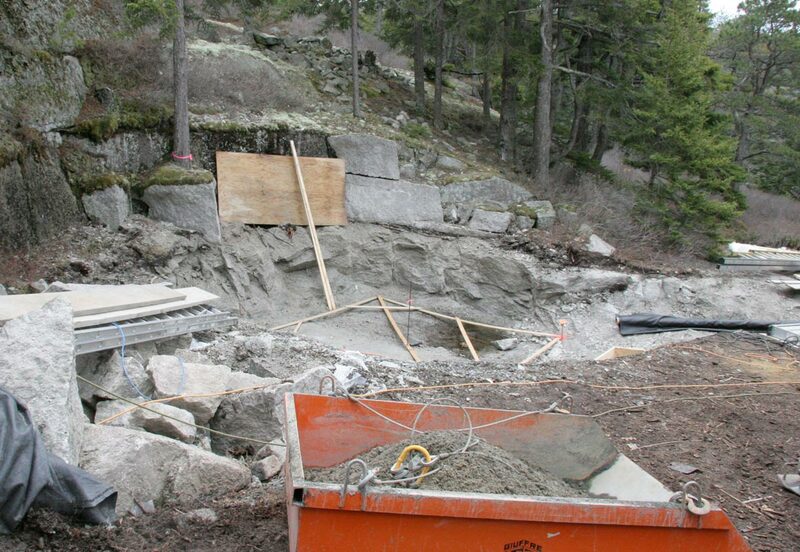 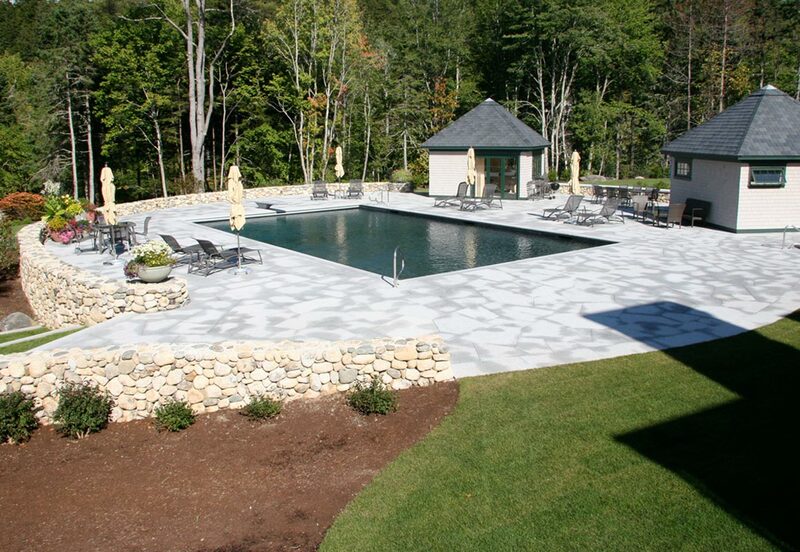 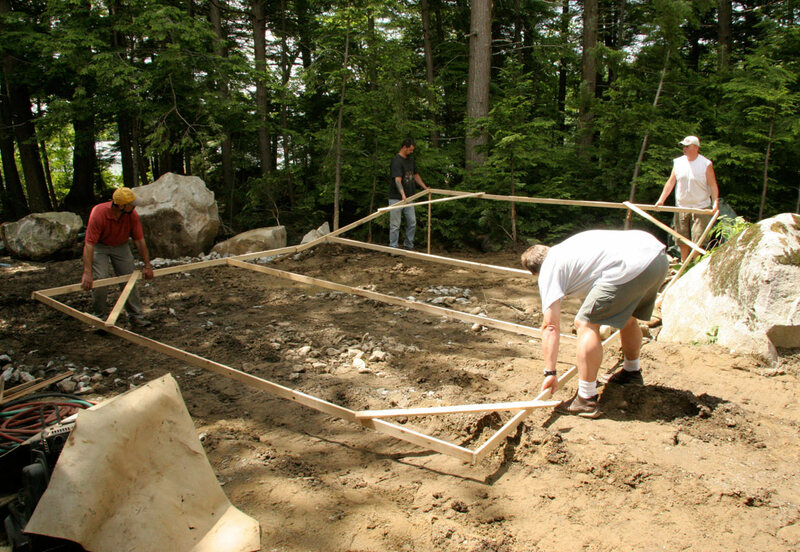 Existing boulders became a part of the design with additional stones added, to create a large scale stone pool with boulders spanning more than 14 feet.